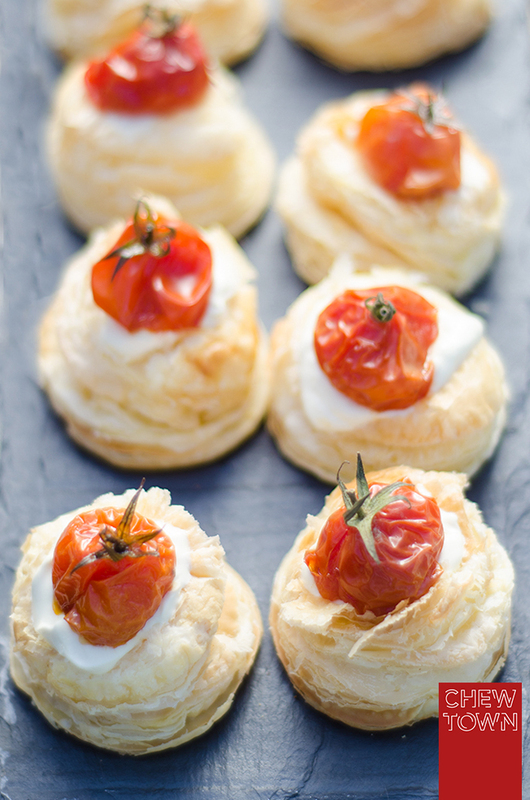 In part two of Chew Town’s epic picnic of 2013, I bring you possibly the easiest and tastiest three ingredient recipe ever – these handsome Roasted Tomato and Creme Fraiche Tartlets. These were born in the final hours of my picnic preparation session (read all about it here) after I had already suffered two intense dish defeats (including an unsuccessful batch of tomato tartlets) due to a puff pastry V shortcrust pastry mix up (note to self: clearly label packages of defrosting puff and shortcrust pastry). After a refreshing night’s sleep, and upon assessment of the one packet of Careme puff pastry I had left, I knew I had to try and make tomato tartlets again, but this time I knew I needed to simplify it to avoid any more expensive pastry collateral damage. The best thing about these tartlets is that despite their delicate appearance, they travelled to the picnic beautifully and looked a treat on the table. There were many wonderful comments received about how they looked, but more wonderful was the reaction they got when eaten – surprising for only three ingredients (the key is definitely good quality puff pastry). Without further ado, you’ll find the recipe below. As well as being great picnic food, they would also be great as canapes for your next dinner party. Defrost the puff pastry as per the packet instructions and preheat oven to 180° Celsius. Place tomatoes on a tray and spray with olive oil. Roast in oven for 15 minutes until skins have wrinkled. Once puff pastry has defrosted, cut 10 circles out of the pastry with a chef’s ring and place on a lined baking tray. Bake until puffed and golden then remove from oven and set aside to cool. Once cooled punch a small hole in the top of each round of pastry add a dollop of creme fraiche and top with a roasted tomato. Now this is as easy as it can get. Love how its made with 3 ingredients, and you’ve made it look like a stunner! these look so adorable! perfect for picnics! Recent Post: In The Annex- Forest Lodge. Ohhh these look like the perfect little crunchy-tangy mouthful! These look like so much fun! Lovely – perfect for a picnic, terrific with cocktails. Good stuff – thanks. Love the simplicity. Love the appearance. Love they are just 3 ingredients. Such a great thing you ‘can just whip up’ when friends pop over (or picnic). They are just so cute. I can imagine myself shoveling it down in one bite and having to deal with pastry smatterings all over me for the rest of the day! LOVE THIS! So simple and perfect for my morning meal , Thanks for sharing such easy and tasty tarts! !